You've gotta love a t-shirt. Well I do anyway. I think my fetish started back my young indie pup days. Disorientated from pogoing for an hour, I would often come stumbling out the hall or club or bar, dripping in sweat and giddy on snakebite and black and I would always make a beeline for the t-shirt stall. I used to have quite a collection of band t-shirts but slowly but surely they've disappeared over the years and have been replaced by lairy, 'ironic', sloganized ones. You know, the kind that has a picture of Ollie Reed on the front with "Drunks Make The Best Lovers". Ho ho ho. How funny and yes 'ironic' because we all know that drunks almost certainly do not make the best lovers. How do I know this? Well it's been pointed out to me of course. Putting all past indiscretions and "hello flopsy wopsy" comments aside for a moment, I have to say that I was pleased as punch when I got an email from We Admire, purveyors of witty, stylised t-shirts with the offer of a food inspired one. Naturally I said yes and received their Full English Please in the post. 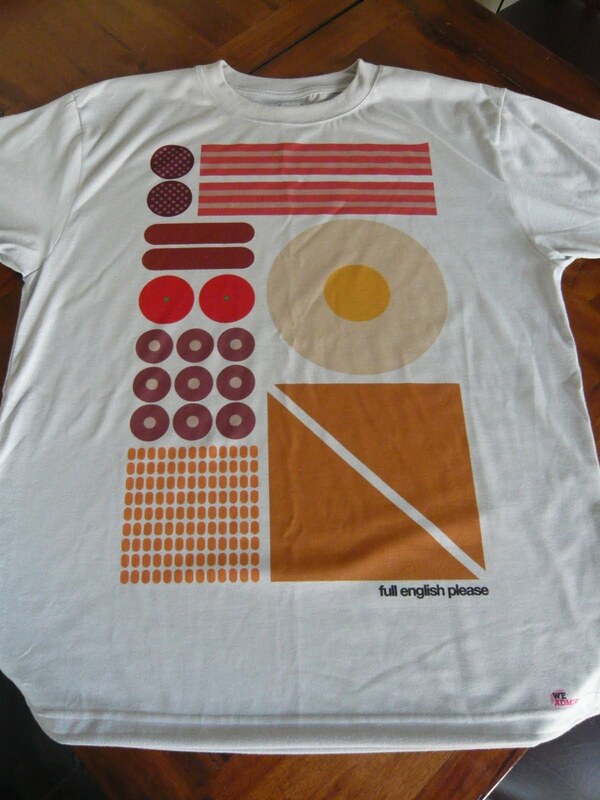 Breaking down the traditional English brekkie into precise, graphic components, I thought it was a pretty funky looking t-shirt, very Bauhaus. So, somewhat cheekily, I asked for another one with the idea of running a little competition. The first one in fact on Food Urchin and the competition is simples. Just post a comment, describing the worst breakfast you've ever had. It was going to be the best but after my little jaunt to The Hope the other day, I figured stories about your crappiest would be more entertaining. So whether you fancy the t-shirt for yourself or for a loved one please post your comments by May 6th, Election Day! The winning entry will be picked by random by using the very democratic method of writing names on little bits of paper, screwing them up and mixing them in a bowl of some kind. 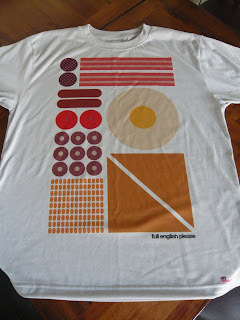 Win this t-shirt for yourself, partner, relative, pet, whatever! Hello luvvie! I want one! Will it be big enough to enclose my ample girth? Oh and what's the closing date? TA! As for worst breakfast - surely I win? Good God Your future career as an underwear model is assured Mr Food Urchin. Very fetching Sir. I have one complaint. Why, in the English breakfast, does it feature streaky bacon, which I associate with American breakfasts? 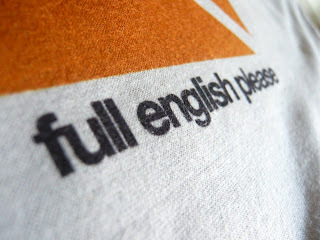 Oh dear God, after looking at your pic modelling said t-shirt....I don't want one - almost like anti-advertising. My worst brekkie was in Czech Republic - boiled carp (flabby skin, bones, white eyes) served with drab, watery boiled spuds. I would have gagged if it were not for the slivovice - hello! My worst breakfast was the first breakfast I ever sent to someone. Picture the scene: my mother was stealing some well earned rest while her two toddlers roamed the house. Little did she know what we were up to. I was no more than 3, probably 2, and my sister 1. She spied me approaching with a dodgy looking brown paper bag that was slightly soggy, when I proudly presented BREAKFAST! Breakfast was a brown paper bag full of corn flakes, milk, sugar and cracked eggs, shells and all. I was so very keen for her to eat it she had to pretend to. She then got up and found my sister standing in the toilet bowl, just able to reach the handle, and flushing it furiously. The carpet was destroyed. I went to that site and they don't appear to have any women's tshirts, but I'll enter anyway. My worst breakfast shows me up to be a bit of a spoiled brat. I was back in New Zealand and Mum was making me pancakes. She's usually quite good at making pancakes, but this time something was wrong. "Why do they taste weird?" I asked. "Did you cook these in margarine?" "No, I cooked them in butter". I looked at the pack. "Mum, this is butter *spread*. It's 50% olive oil. You can't cook pancakes in it, they taste gross." "Well it's still butter!" Sigh. Then I put maple syrup on them. "Yuck, what is this stuff?" "This does NOT taste like maple syrup, it's too sweet." "Go on, look at the bottle, it is maple!" I looked at the bottle and it turned out she'd been duped by some rather misleading labelling. The bottle was the shape of a maple syrup bottle and labelled "Canadian syrup". A scan of the ingredient list revealed a tiny bit of maple syrup, and the rest was sugar and chemicals. She hadn't twigged that since it was half the price of maple syrup, maybe it wasn't the real thing. Worst pancakes EVER. EssexEating - Dan, you're not hiding your jealousy well, that picture is the only reason you've gone jogging. Niamh - aw, excellent story and now you've given me the shits that my kids will do the same. Fingersandtoes - Blimey, you were a spoiled brat! My husband would absolutely love this t-shirt. He normally only wears art work involving monkeys or space ships but I think he'd extend his repertoire for this. My worst breakfast would be a grease soaked heart attack on a plate in Asda in Nuneaton, Warwickshire. We'd opted for that rather than the dry bread roll in a carrier bag that would have been slung over our door at the Travelodge on the Bedworth Bypass. It had been an unexpected stopover hence the dreadful accommodation! 1) Hmmm, worst ever. I have a short memory so there's no doubt worse ones I've forgotten. A few years ago I went to India on holiday, on my own. No Pete in tow. I was attending this special festival of wildlife, an expensive trip which Pete didn't particularly fancy, so, as I knew lots of people also going, he suggested I go on my own. Such a sweetie. The trip was being sold by a UK tour operator but, of course, they were using a local Indian company. The owner of the Indian company came along on the previous year's festival to the Galapagos Islands, they are annual events, to see what they were about. For some reason, several people on the boat assumed that, since we were both Indian (the only two on the trip) he was obviously my dad. Yes really, two Indians of different generations, they MUST be related. This amused me greatly, and anyway, we got on really well, so I did indeed call him dad for the rest of the trip! So, back to the India trip. I decided to fly out several days early and do my own thing. Somehow, I ended up accepting an invitation to visit with my "dad" for a few days, the plan being to take a little holiday with his wife and daughter, she was about 9 or so. Of course, I get there to find he can't make it and I'm taking this little trip with his wife and daughter, who I've never met. So off we trundle, and actually, it's pretty good. We're visiting a number of properties their travel company might want to represent/ sell to visitors - a fam trip. So we end up in one incredible palace, a place so very full of features, history, decor... it's a tourists dream. Except the owner has done the conversion on the cheap and the grandest of bedrooms are let down by plastic bathroom suites with leaks everywhere, little hot water, rusty plumbing. Such an odd place. The owner isn't there and the entire place is being run by a slightly crazy manager called Bubbles. I kid you not, a wrong side of middle-aged lady called Bubbles. So I head to my enormous suite for the night. There are no mosquito nets, and more mosquitos than I've ever encountered in my life. And mossies love me. Even when there's only one in an entire country, it will find me. Here there were thousands. 2) There were some electric fans available, so strong they were more akin to the fans used to test aerodynamics in a wind tunnel than keep people cool. I dragged the heavy things right next to my bed, the breeze so strong I could hardly stay on the bed myself. And yet, somehow, these bloody killer mosquitos were still able to land and bite. I wrapped as much of myself in sheet as I could but still they bit bit bit all through the night. Especially during the hours of power cut, they seemed to sing with happiness during that time, oh yes. So by 4 am, I put the lights on, got up, and waited with increasing desperation and hysteria for breakfast. I was the first down, and had this surreal meal on my own with Bubbles, trying hard to remain polite about all the shortcomings of the property (of which there were several, such as expecting guests who were complete strangers to walk through each other's bedrooms to access their own). And her staff bought me out dish after dish of freshly fried purees, fruit, vegetable curries, eggs, a strange mix. Eventually, my companions emerged and we set off for home. On that several hour drive back to Delhi, I grew sicker and sicker. Stopping by a very very busy roadside to puke up your breakfast is not a good thing, especially when you're still trying to make a vaguely good impression to the people you are travelling with. I think we saw a dancing bear too, so sad. Though to be fair, I may have imagined it. I was quite delirious by this point. We made it to their home and, thank goodness, they gave me an ensuite guest room, and I spent much of the time enconsed in that bathroom. 3) A few hours later, I ended up in hospital, one run by my dad's best mate (and colleague from med school days). I speak no hindi so I was relieved to be there, and yet terrified of all these well-meaning jabbering med staff. Luckily, the drip treatments worked, and I checked myself out the next day in order to be able to join up with the main trip I'd come to India for. The rest of the breakfasts on the trip were far better... I still remember the freshly cooked thick American-style pancakes with slices of banana and hot sweet syrup served at the lovely posh camp we stayed in at Ranthambore before heading out to search for tigers during the day!